Description (ebay): Size: 6 Resin water filters The secret to better coffee, GEESTA water filters. Size: 6 Resin water filters The secret to better coffee, GEESTA water filters. - FOR THE BEST TASTING BEVERAGES: Exchange the replacement water filters every couple of months or every 60 water tank refills, replace them more often, if you have hard water in your area. - COMPATIBLE WITH BREVILLE: BES920XL, BES980XL, BES900XL, BES860XL, BES870XL Barista Espresso & BES840XL Infuser Espresso Machine and BKC600XL & BKC700XL Gourmet Single Cup Brewer. - PACKAGE INCLUDES: 6 counts of Resin Media Water Filters fit Breville Coffee Machines. 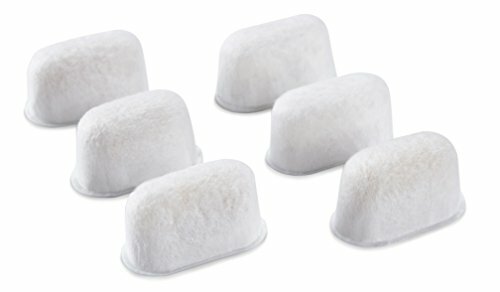 - SUPERIOR QUALITY: All water filters are made out of resin in order to protect your Breville coffee machine from the damages posed by hard water buildup also eliminate the smell and taste of chlorine, sulfur and iron as well as some minerals, soften the hard water with a progress called ion exchange. - EASY AND SAFE: These Breville Espresso replacement filters are incredibly easy to use as they are designed to simplify the filter exchange process. Each water filter is individually sealed with sufficient amount of resin beads in order to ensure the highest level of satisfaction.